I beheld a great wonder in heaven, a woman clothed with the Sun, with the Moon at her feet. And on her head was a diadem of the twelve stars. 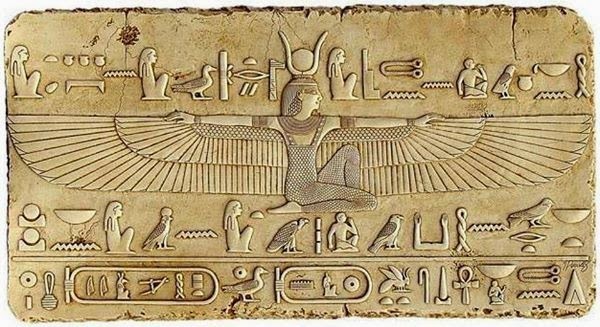 Hear me, O Lady Isis, hear and save. O thou queen of love and mercy, thou crowned with the throne, thou hauled as with the Moon. Thou whose countenance is mild and glowing, even as grass refreshed by rain. Hear me, O Lady Isis, hear and save. Lift up thy voice to aid me in this critical hour. Lift up thy voice most musical. Cry aloud, O queen and mother, to save me from that I fear most. I invoke thee to initiate my soul. The whirling of my dance, may it be a spell and a link with thy great light, so that in the darkest hour, the Light may arise in me and bring me to thine own glory and incorruptibility. Isis am I, and from my life are fed all showers and suns, all moons that wax and wane, all stars and streams, the living and the dead, the mystery of pleasure and of pain. I am the Mother. I the speaking sea. I am the Earth in its fertility. Life, death, love, hatred, light, darkness, return to me, to me. Isis am I, and to my beauty draw. All glories of the Universe bow down, the blossom and the mountain and the dawn. Fruits blush and women are creations crowned. For as we now receive thee into our hearts, we ask that you never leave us, in times of trial and joy, and even unto death."